Like an old storyteller spider, I’ll weave an idea in your mind, a dream round your heart, that you may be happily trapped thereafter. 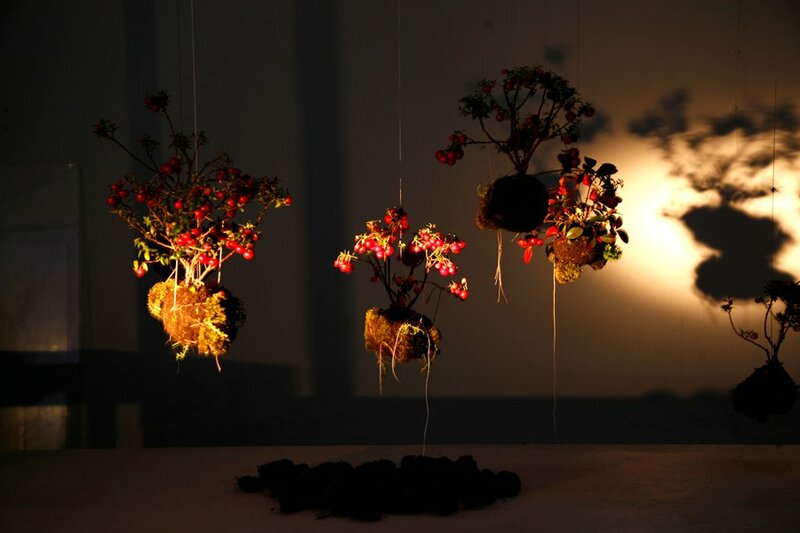 Imagine, first, a solar system writ in miniature life; a botanical orrery suspended from your ceiling with spheres of moss and other plants, bound tight in brilliant white cordage. This string garden of kokedamas (moss ball bonsai) rejects your puny attempts at gardening in two dimensions, and insists you think in three. 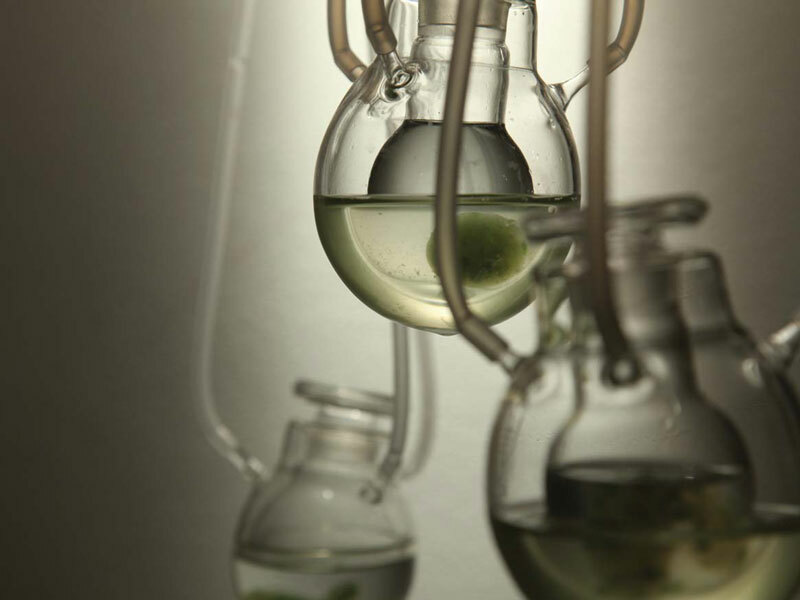 I love this photograph – it’s Guan Lee’s shot of Marin Sawa’s Algaerium interior design project (seen over at Inhabitat). I love the muted earthy tones with both a watery organic feeling, and brittle clean science fiction vibe. It doesn’t hurt that algae are such a strange and wonderful kingdom of living curiousness. Not animal, and in a different (but distantly related) biological category to plants – algae is different enough to be all on its own. Then add in the fact some kinds can be eaten, some are fertilizer, some can be used as biofuel, some efficiently scrub CO2 into oxygen for us to breathe (potentially in space) and some even glow. Glow! I had wanted to watch this for a long time – a short sci-fi film of a post apocalyptic settlement somewhere in Africa, reeling from the mistakes leading up to the great war for water. The main character, Asha, is the lone, desperately hopeful, curator of the museum of natural history. Nobody visits these dead relics of a dead surface world, but she dreams forbidden, and drug-suppressed, dreams of water, trees, and life! It’s a quiet film where nobody speaks with their mouth – I don’t know if that’s to conserve water, Dune style, or if in the future people are so used to typing that actually speaking out loud is just something you don’t do. It’s a refreshing film where it’s actually really nice to have a lead actress who doesn’t look like all the Hollywood actresses. It’s a sad film, where I couldn’t work out which meaning the ending had – but neither of them were kindly. If you can manage to find it, watch Pumzi. There seems to be no showings, no releases, no word on their blog since the beginning of 2010 – but if you do come across it, it’s not 20 minutes wasted.